Restaurant: Chef David Burke's flagship location is David Burke Townhouse. Serving innovative modern American cuisine in New York City’s Upper East Side, David Burke Townhouse is a neighborhood fixture. The restaurant, which opened in 2003, wows visitors with an impressive wall constructed of pink Himalayan salt. Chef: David Burke is an American chef, an artist, an inventor, and an entrepreneur. With 10 restaurants, a host of awards, and a U.S. patent for his unique process—dry-ageing steaks with pink Himalayan salt--Chef Burke shows no signs of slowing down. 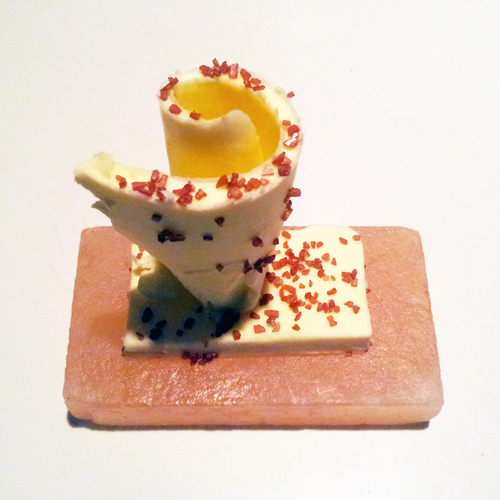 Butter: Waiters serve tulip-shaped sweet butter lying on a pink Himalayan rock salt slab. Finished with Red sea salt, the butter display is like an explosion. Guests are encouraged to scrape off their desired amount of salt. Commentary: While Chef Burke was growing up on the Jersey Shore, his dad was a health-nut. “We had no sweets, we had no butter,” Chef Burke says. He remembers wondering why the bagels at his uncle’s house tasted so much better than the bagels at his house. “It was because my uncle served butter and my dad was a margarine guy!” he recalls. “My first memory of using butter as a cook was with Waldy Malouf, the chef at La Cremaillere.” On Chef Burke’s first day, Chef Malouf told him, “This is a French restaurant; you’re going to use a lot of butter and a lot of salt.”. It was 1982 and Chef Burke was shocked at the amount of butter required for traditional French cooking.